Yeah, I know. This blog has been very quiet. But that’s only because my life hasn’t been. A lot more doing and a little less documenting. So here, in a nutshell, is a rundown of some of the good stuff I’ve been up to. If you haven’t heard of Will Allen or his magical agricultural oasis in Milwaukee called Growing Power yet, you must not be paying attention to the sustainable urban agriculture movement. Oh wait, according to Will it’s not a movement, it’s now a revolution! My understanding of revolutions is that they are loud… can’t you hear the roar, the passion in Will’s voice? We went to one of his Growing From the Ground Up weekend workshops a few weeks back. I just got around to uploading the pictures. Check ’em out! Soil is the basis of life on earth. Without its nutrients and hard-working microorganisms, plants would not grow, we would all quickly starve. In the city, we’ve got some pretty horrendous soil. Poisoned with petrochemicals and heavy metals, compacted, often just dead. 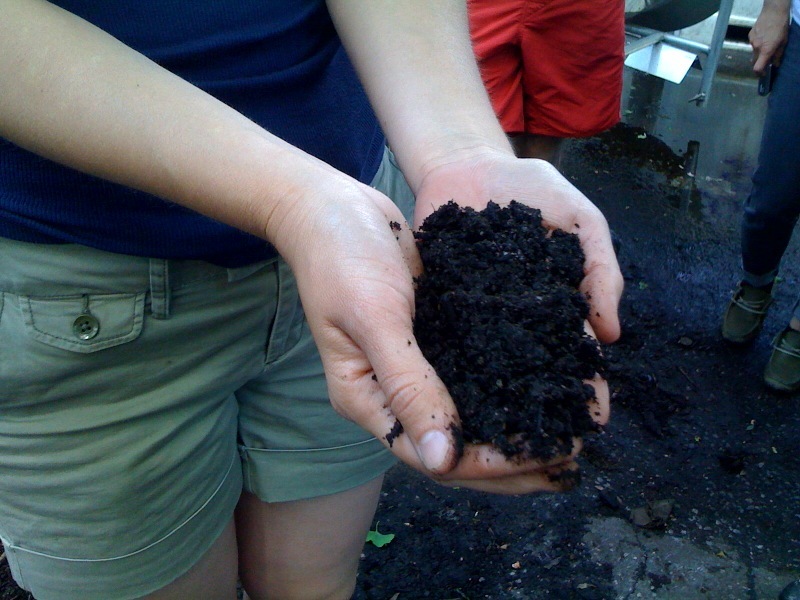 Compost brings life back to the soil. I’m having a great time learning all about decomposition, soil organisms, and all of the challenges city composters put up with in the Master Composter training through the NYC Compost Project in Brooklyn (at the lovely Brooklyn Botanic Garden). 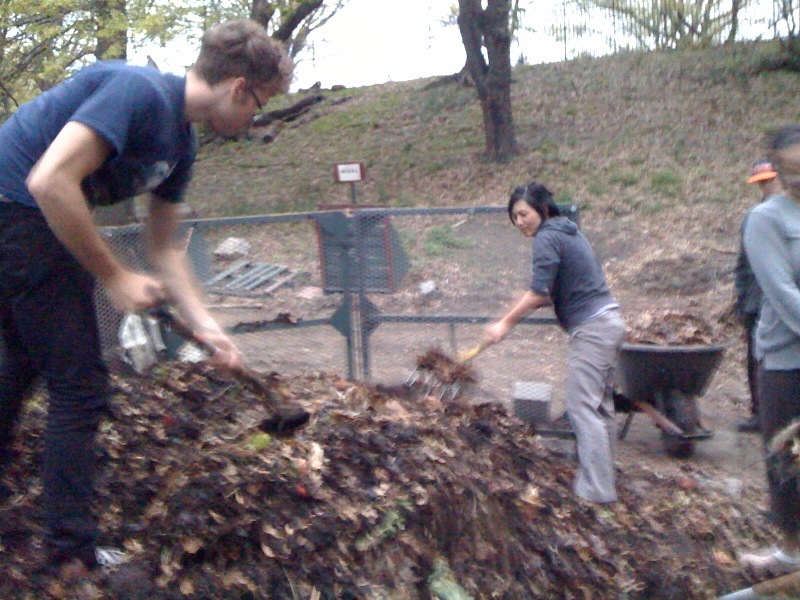 I’ve met some really cool, passionate people in the class who all love to geek-out on all things compost. In the next few weeks, I’ll be working with a classmate on some fun compost-related projects in order to fulfill our community outreach hours. And then there’s the Masters of Succession presence at the Figment Festival happening in the middle of June. Learn more about that here. These days I’ve got compost on the brain. 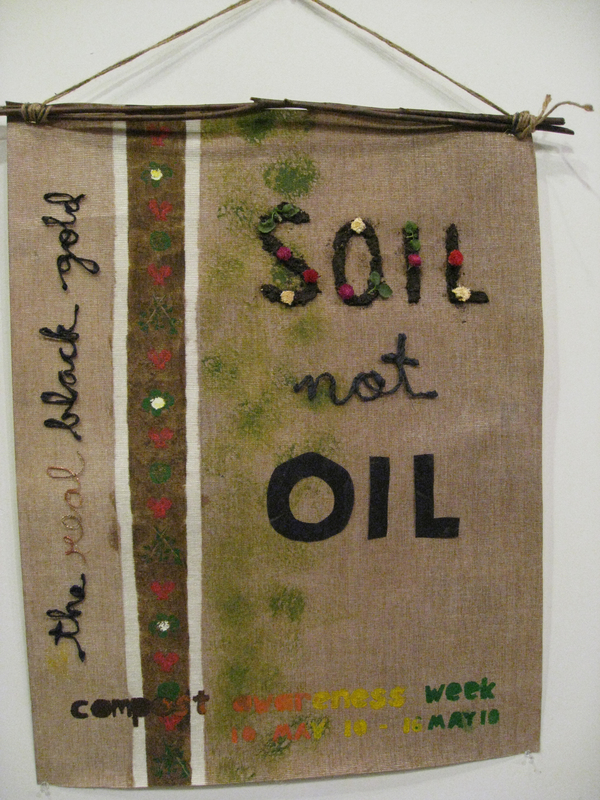 So I’ve poured this love for black gold into creative expression. 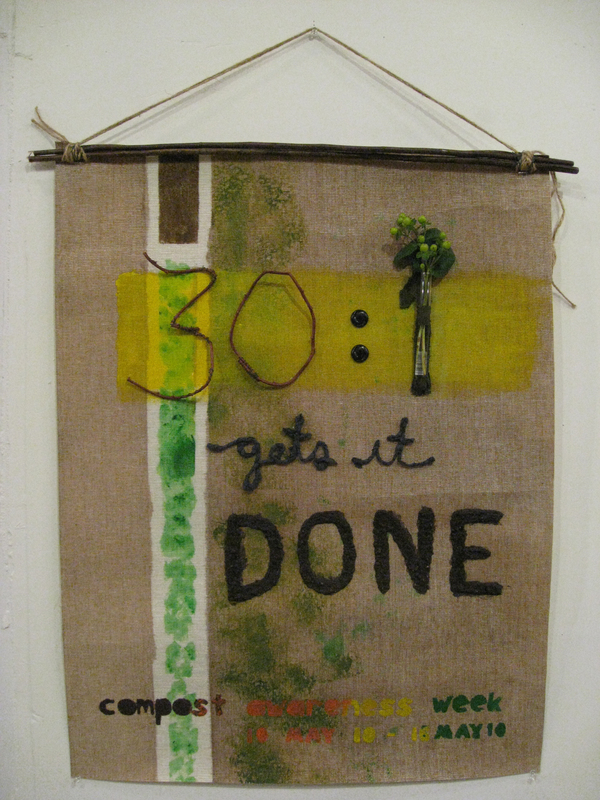 The Work Office (TWO) is a project put together by Katarina Jerenic (aka Katsie) and Naomi Miller that mimics the Works Progress Administration’s (WPA) role in employing artists and other public workers around the time of the Great Depression. 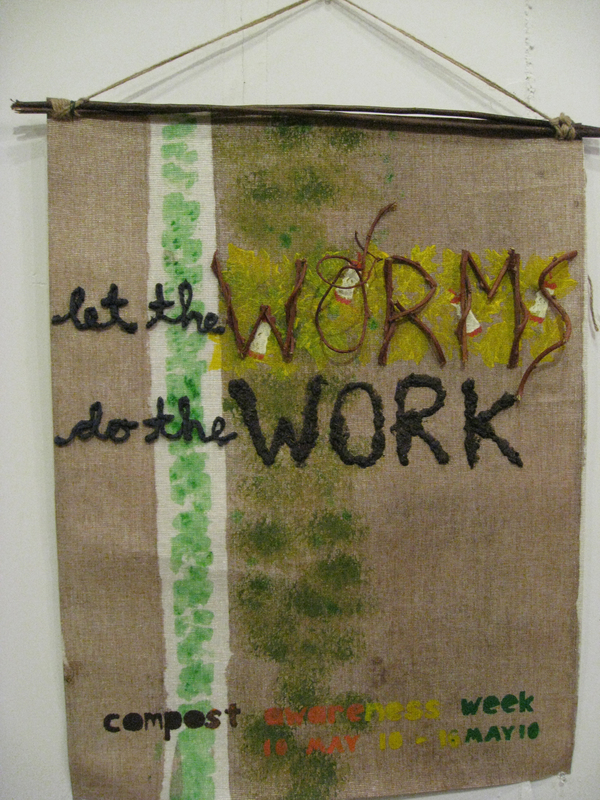 I worked for TWO last week in order to promote a new event – Compost Awareness Week – via mixed media poster made from upcycled and natural materials. You can visit the work at 156 William St (corner of Ann St) until next Thursday, May 20 (hours here). 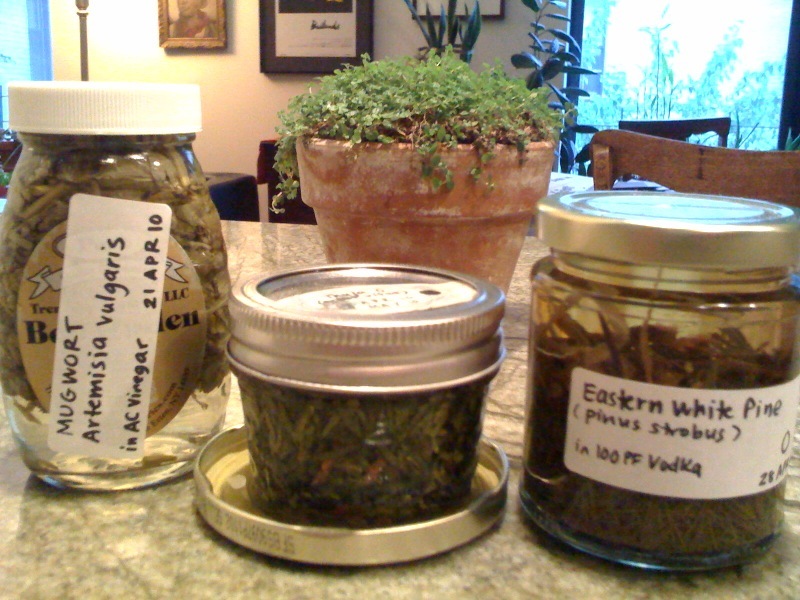 Wednesday nights are spent with Robin Rose Bennett at the Open Center making herbal tinctures, decoctions, and infusions. It’s a joy to make medicine with my own two hands while singing with my classmates and putting ‘good energy’ into our jars of botanical concoctions. You are currently browsing the Raganella blog archives for May, 2010.